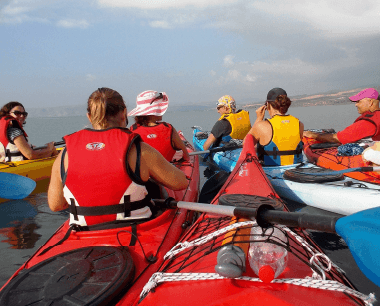 Forget about taking a boring old tour bus around the sites of the Sea of Galilee – try unforgettable kayaking tours to bring the famous sites around this magnificent lake to life! There’s nothing quite like paddling the Sea of Galilee (Lake Kinneret as it’s known in Hebrew), while enjoying the true tranquility of one of the world’s most famous lakes and the surrounding area where Jesus Christ walked and taught over 2000 years ago. 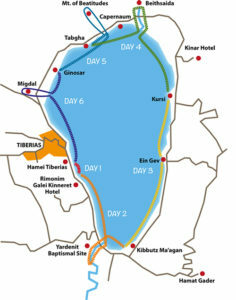 Walkonwater paddling journey is along the water front of Bethsaida birthplace of Christ apostles Perter, Andrew and Phillip, the Church at Capernaum, allegedly the spot where Christ chose his twelve apostles, the Church of the Primacy of St. Peter, where Jesus entrusted Peter with continuing his work and so to lay the foundations of the Christian religion and Church of Loaves and Fishes in Tabgha, where we can see the world-famous mosaic of the Miracle of the Loaves and Fishes which more than anything, symbolizes the miracle of the feeding of the 5000. The area is a birdwatcher’s paradise. Every year, 500,000,000 birds migrate via the Syrian-African Rift Valley, a large proportion flying over the Sea of Galilee. A Special Walkonwater waterproof Bird guide help to identify cormorants, large flocks of pelicans, ducks, herons, kingfishers. Our guides are experts in communicates the background of the Flora and the Fauna of the lake. The paddling pace is comfortable, and there is plenty explanations of the environment, ecology, and local history. During the stops at church with an amazing shady place surrounded by palm trees and many peacocks, overlooking the lake (paradise) we are serving Fresh fruit, dates, nuts, cheese, bread, halva. The tour end near Tabgha Pilgerhaus, under fantastic bamboo chapel with another great lake view, as well as enjoy coffee / beer / cake / and German Apple Strudel. Walk on Water paddling and entering from the beach to the famous holly church provide spiritual experience. Walking from the water side to Mensa Christi and Capernaum provide unmatched experience of touching the past at the time when Jesus gathered his disciples and conceived Christianity. Finally home! Here is a video from our fun kayak trip. Seems so long ago that I looked at the snow on the pine trees of northern Michigan. Thank you for such a wonderful day! I will never forget visiting the holy places by kayak and I would recommend this tour as 5-star program to Trip advisor. We thoroughly enjoyed our paddling trip. As well as a beautiful experience it was very good exercise. תודה לך עמית שסידרת לנו הזדמנות פז לפגוש את חברינו משכבר הימים ולהכיר חברים חדשים. היה אכן סיור מיוחד ,של טבע ,היסטוריה, ספורט ואנשים טובים.